Firefighters and deputies responded to a wind turbine fire near the village of Elkton. Jeff Smith, an Elkton village official, said the fire is 300 feet in the air and crews cannot reach it to extinguish the blaze. Smith said the fire will likely burn itself out. 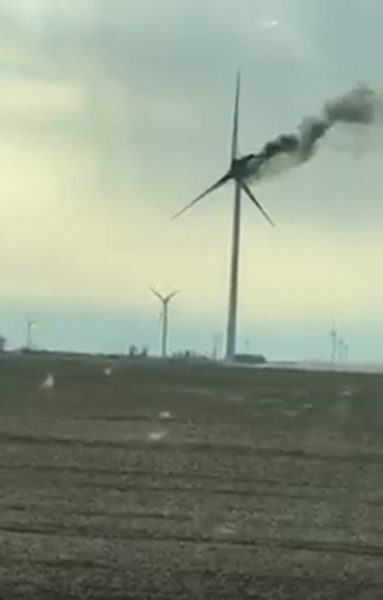 Jared Schuette owns the property where the wind turbine is located, he said that this is quite an ordeal because this has never happened before. “It’s insane, it’s a small town and everyone was coming from everywhere to record it and take pictures,” Schuette said. Officials are securing the area as the large blades, made of fiber glass and wood, may fall to the ground. 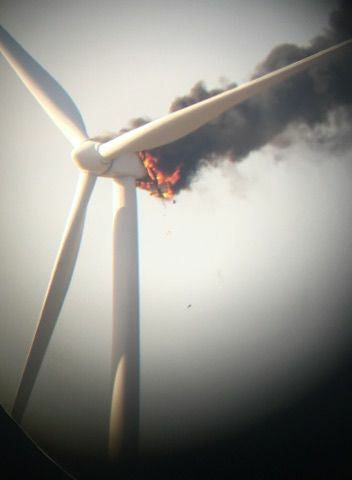 “I was surprised that the blades didn’t fall off, we really were interested to see if they would because that would’ve been quite a boom,” Schuette said. Smith said not much can be done to extinguish the flames, but the Oliver Township Fire Department and Huron County Sheriff’s Office remain on the scene to secure the area. Schuette said that everyone around watched the fire burn in amazement. “We were just shocked, we’ve never seen this. There’s 100s of windmills around us and we never ever had anything like that happen and they’ve been up for 12 years now,” Schuette said.